The Castle Hill of Budapest is a blend of picturesque cobbled streets, townhouses, galleries, museums, cosy restaurants and historic monuments.Four main parallel streets run along the Castle District, all which you can explore in about two hours. Make sure you stroll along one of them from Bécsi Kapu tér to Díz tér or vice versa and then return along another street. You’ll most probably find open doors – sneak in and admire the inner courtyards of the houses (Don’t worry, it’s allowed). The Castle Hill of Budapest (Várhegy) was first settled in the thirteenth century, after the Mongol invasion of 1241-42. King Béla IV (1235-1270), determined to protect his homeland, moved the country’s capital from Esztergom to Buda and led Buda’s citizens to seek a strategic place to build their own defensive neighbourhood. A fort and a royal residence were constructed. 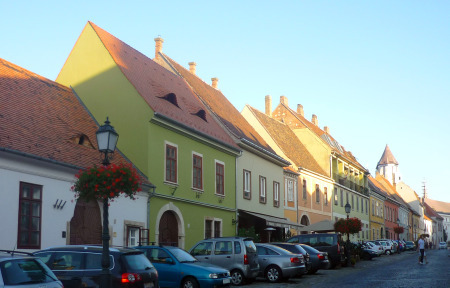 On the remaining area of the hilltop, a new burghers’ town, surrounded by thick walls raised, where citizens from the Víziváros and other defenceless areas settled. There were over 31 sieges during subsequent centuries and the district had to be rebuilt on several occasions. If you have enough time, pop into one of the old-fashioned pastry shops or traditional restaurants that you’ll find along your way. Ruszwurm cukrászda is one of those cosy confectioneries that offers a great variety of Hungarian traditional pastries. It was founded in 1827 and still looks the way it did back then, with the same original furniture from that era. 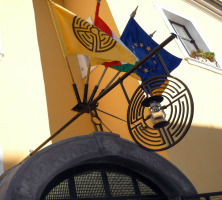 It is located at Szentháromság utca 7. The Buda Castle Labyrinth is a 16 metre deep, very impressive complex of natural and artificial caves formed by the effects of hot thermal spring water on calcareous rock. These passages were enlarged and converted into cellars in the Middle Ages and were used as refuges and even as a secret military installation during World War II. Today, you can find several exhibitions here, such as the Prehistoric Labyrinth, the Labyrinth of Another World and the Labyrinth of Courage, among others. You can explore the caves with a tour or, if you feel brave and don’t fear the dark, you can go on your own (for some people, this can be a scary experience). Don’t forget to bring your map – and a pullover – the passages are dark and damp. There are two entrances to the Labyrinth, one at Úri útca 9 and the other one at Lovás ut 4A. The Labyrinth of Castle District has recently been designated as one of seven underground wonders of the world. 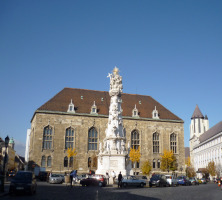 The square takes its name from the gate, the northern entrance to the Old Town. It is surrounded by interesting and colourful houses. The Castle Hill of Budapest offers some spectacular views: start by climbing to the top of the Vienna Gate. 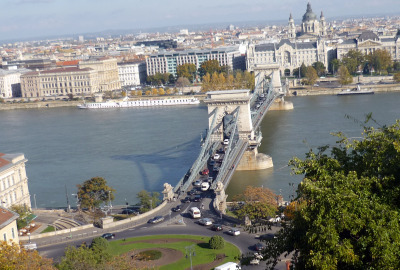 It’s always accessible and from here you’ll be able to admire the Buda Hills, as well as Margaret Bridge, Árpad Bridge and the recently built Megyeri Bridge. Right in front of Vienna Gate is a Neo-Classical Lutheran church built in 1896 by Mór Kollina . Next to the gate is the National Archive of Historic Documents building, a Neo Romanesque edifice with a multicoloured roof, designed by Samu Pecz (also responsible for the Great Market Hall). On Táncsics utca (the very first street to the left off of Bécsi Kapu), you will find many of the most beautiful Baroque dwelling houses in the Castle Hill of Budapest; some of the houses have plaques with the word műemlék (memorial) that explain their historical associations. This church was built in the 13th century in Romanesque style. It was the parish church for the Hungarian Christians (Mattias Church was exclusively used by the town’s German population). During the first half of the Turkish occupation, it was the only church in the Castle Hill of Budapest where Christian services were allowed. It later became a mosque during the second half of the Turkish rule. After World War II, in 1952, most of its walls were demolished and only the tower remains. 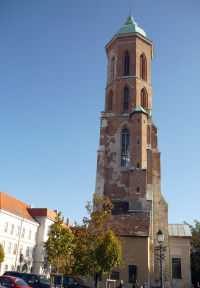 This solitary tower stands at Kapisztrán tér 6. From Bécsi Kapu, walk west on Petermann Bíro utca to Kapisztrány tér and then to the outer walls of the Castle complex. Here you will find beautiful Buda Hills scenery. Take the relaxing walking path (Tóth Árpad Sétany), among the chestnut trees, all the way up to Dísz tér (near the main entrance of the Castle). 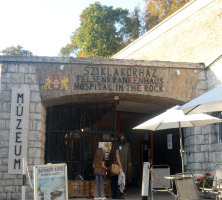 This unique museum is located at Kapisztrán tér 2-4, a few metres west of the Vienna Gate. It houses Hungarian military written material, memories and traditions, as well as a wide range of military items dating from as far back as the 11th century. Next to the museum is the Town Hall (Városháza)of the Castle Hill of Budapest. Holy Trinity Square is the central point of the Castle Hill of Budapest. In The middle of the square there is a column representing the Holy Trinity, it was built in 1713 after an epidemic of the plague was overcome, hence its name. A neo-Gothic palace, right behind the Holy Trinity; it is owned by the Hungarian Culture Foundation, which hosts free arts and technical exhibitions throughout the year. A white two-storey building with a small green clock tower, across from the Burg Hotel. It’s Buda’s Old Town Hall. Opposite the Hilton Hotel, stop in to taste some of the most representative Hungarian Wines at the Hungarian House of Wines. The house stocks a complete range of all of the wines produced countrywide. The imposing Mattias Church, and next to it the Fishermen’s Bastion, are also located on Holy Trinity Square. The statue you’ll see right in front of the Bastion is the statue of St Stephen or István, the country’s first king. This Top Secret Military Hospital was built in a section of the cave system of the Castle District during WWII. Its construction began in 1939 and it became a working hospital in 1944. The hospital was fully equipped, even including its own independent power generator. Its main purpose was urgent medical and surgical treatment for civilians and soldiers. In February of 1945, Soviet troops took over the city, and that July, the hospital was closed down. In 1956, during the Cold War, the hospital was reopened, in order to take care of the wounded victims of the conflict, but again it closed its doors in December of the same year. In the early 1960’s, with threats of a nuclear or chemical attack, the hospital was converted into a nuclear bunker – all of the required facilities to be able to house survivors were added to the construction. The complex was opened to the public in 2006 and today it displays a wax exhibition that shows life in the hospital, a history of civil defense and military surgery. The war hospital’s atmosphere is recreated by original items and more than 70 wax dolls that depict the circumstances of the times. The Secret Hospital is located at Lovas út 4/c; the entrance is outside the wall complex. It is open Tuesdays to Sundays from 10 am-6:00 pm. 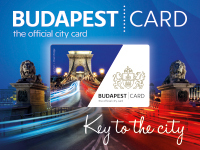 Teachers, students, seniors and Budapest cardholders are entitled to a discount of up to 50%. 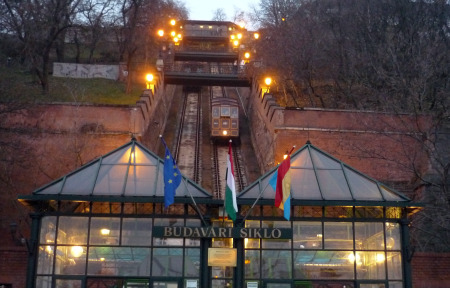 The fastest way is to take the funicular railway (Sikló) up from Clark Ádám tér (Adam Clark Square); the ride takes only about 2 minutes. This way gives you the opportunity to catch the beautiful city panoramic views (for the best view, get on the lowest compartment of the car). If you enjoy walking and are not in a hurry, then walk up along any one of the several routes that will easily take you to Fisherman’s Bastion. Take the Royal Steps (Király Lepcsõ) at Clark Ádám tér, beside the funicular, or explore the other ways up on the eastern hill area and enjoy a pleasant journey. Another way to go up on foot is to take the wide staircase that goes up to the southern end of the Castle from Szarvas tér. Alternatively, you can travel up by bus. Take the Várbusz from Moszkva ter (walk up the stairs to the northeastern part of the square to Várfok utca). A blue minibus with a castle symbol and the sign “Várbusz” or” Dísz tér” takes you all the way up to the main square. If you prefer, you can also walk all the way along Várfok útca (from Moskva ter walk up the stairs heading northeast). 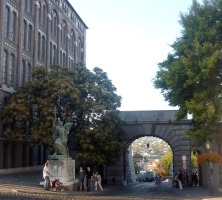 It leads you straight away to Bécsi Kapu (Vienna Gate), the main entrance of the castle. Another choice is to look for Fiath János street, which you will find right next to the petrol station you see from Moszkva tér; this way also takes you straight up to Bécsi Kapu. This is a short, pleasant walk that allows you to experience the appealing atmosphere and the magnificence of the Castle Hill of Budapest, starting right at its main entrance. Keep walking along the beautiful cobblestone streets, admiring the picturesque townhouses with their courtyards and gateways. There is also a lift running from Palota utca up to the palace complex. You will emerge next to the Lion’s Courtyard. 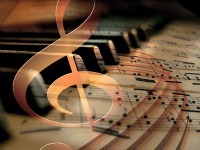 The lift runs from Tuesdays to Sundays from 10:00 am to 8:00 pm. Where to Stay in the Castle District? Are you looking for a place to stay in the Castle District? 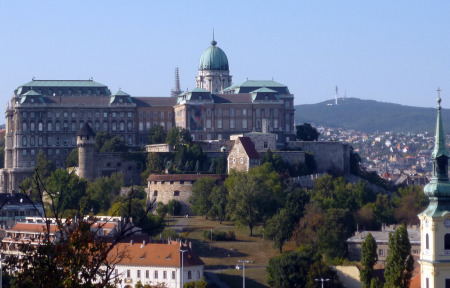 This is a great idea, the Buda Castle area is an excellent choice to stay while in Budapest. If you enjoy walking you will find this beautiful place charming day and night. Walking after hours around the Castle District is a very pleasant feeling you shouldn’t miss. Public transport to the castle area runs constantly, so you shouldn’t worry about how to get there. But if you want to walk, the good news is than in less than twenty minutes you can reach the Chain Bridge and walk through to Pest. • Hilton Hotel is a five star hotel, located right next to the Fishermen’s Bastion. It is a combination of historic architecture and modern comfort and facilities. One wall of the hotel keeps the remains of a Jesuit cloister built in late rococo style as well as Gothic remains of a Dominican church are present in its facade. Views from Pest are great from the hotel’s rooms. • Burg Hotel This is a three star hotel located on Holly Trinity Square, a great place to stay and explore the Castle District.The hotel offers comfortable rooms and great views of Mathias Church and Fisherman’s Bastion with Parliament and the Danube river in the distance. 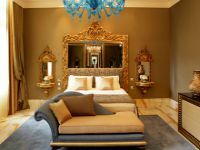 • St George Residence is an enchanting small luxury hotel located in a quiet street of the Castle District. The entire hotel recreates a stylish 18th century atmosphere.All its suites are generously spacious and showcase classical elegance in every corner, they are large and well equipped with kitchenettes and all modern facilities. •Buda Castle Fashion Hotel A stylish four star hotel with spacious and comfortable rooms. This is a very good value for money hotel alternative you can choose if you want to enjoy the Buda Castle’s District charming atmosphere.